Yellow Pumpkin Masala Poori is a spicy poori make with pumpkin or kaddu along with spices to make a filling meal anytime. When I came to selecting for Y, I didn’t have anything in mind. Didn’t know what to make and finally decided to on Yellow colour and had Yellow Pumpkin, Yellow Split dal to select from. So making a poori with Yellow Pumpkin was a good idea and I decided to make it. I made these pooris along with the warqi pooris and we just couldn’t decide which was better. Both the recipes turned out great and would be surely repeating again. So Yellow Pumpkin Masala Poori is my choice for Y in the AtoZ Flatbread and More, where I am doing AtoZ Indian Flatbread. 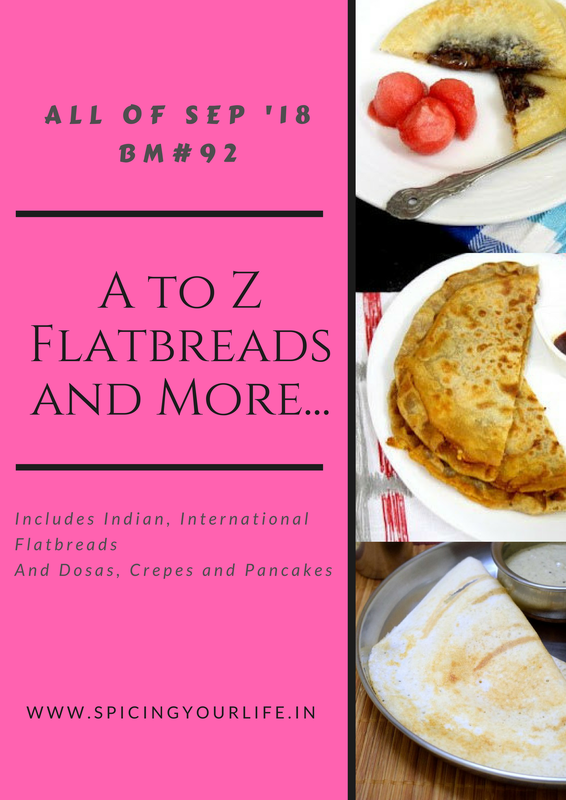 If you keen to know what’s for Y in the AtoZ dosa Varieties, check out. Wash and peel the skin of pumpkin, remove the seeds and chop pumpkin into big pieces. Take it in a microwave bowl and microwave with about 2 tbsp for 5 mins. Allow to cool and mash to a smooth paste. Transfer to a bowl and add all the ingredients and knead to a tight dough. Divide into small balls and dust with flour and roll out to 4 inch discs. Heat oil in a kadai and when hot, gently drop in the pooris and cook on both sides. Yello pumpkin pooris, thats an awesome way to make pooris with vegetables na.. Trusly very brilliant Valli. Never thought of making pooris with yellow pumpkin this way. Awesome yaar. That is such a lovely idea Valli! It is a great way to get everyone to eat more veggies in a tasty fashion. Totally yum! You chose yellow pumpkin and I chose yerra gummadi for the same vegetable 🙂 I loved playing around with the words and ingredients to come up with recipes for the difficult letters. These puris sound amazing. Wow… poori looks so beautifully puffed and love the way of addition of pumpkin in diet. Adding pumpkin purée to a Poori is such a wonderful idea , and the Poori looks so good with all those spices , beautifully puffed up too ! This marathon surely has given loads of new idea to make Flatbreads ! There was one time when I always had pumpkin puree in my freezer and would add it to all my dishes. Adding it in pooris would give it a wonderful sweetness, and I am sure it would be fantastic. Love this recipe Srivalli, a great way to get kids to eat pumpkin and also its something different to make for me from the usual masala (tikhi) puri I make for breakfast. Wow yellow pumpkin puri looks so yum. I have pumpkin at home and now I know what can I use for. Why dint I think of yellow pumpkin! I used Yellow moong for this alphabet inspite of having a huge pumpkin sitting on the kitchen counter! Superb poori Srivalli ,love the color! it is such a fun idea to make flatbreads with vegetables puree. surely adds flavors and kids eat with out fuss. My boys love yellow pumpkin in any form and this would be a great recipe to make for them. It is squash season here and I will make some soon for dinner.